Was looking through some old diaries – 1980 through to 1990 – “what was I doing on this day in…” being the question idly to mind. Wow. Can’t even contemplate what that bill would come out at in today’s money. (That said, £80 spent on my car in one week in 1984 would have felt slightly painful! Probably hence the diligent entry of the figures). The three diaries in the picture represent 1984, 1985 and 1986. (apologies for blurring out my hugely interesting entries… protection of the innocent, and all that jazz 😏). Party years – my God but each week is filled with events. What blissful freedom exists when one is 20-22 yrs old. My Diaries of the Past are in no way literary works of art (not journals, merely a litany of “places I need to be/was”), and I’ve often regretted never keeping a proper journal, but it’s still heartwarming to glance back through these things and I’m glad I kept them, scrappy little throw-away items that they are. They reside in my Little Box of Special Things, along with a few treasured letters, some photos, tickets and invites… I maybe look at them once a decade. It makes me smile. 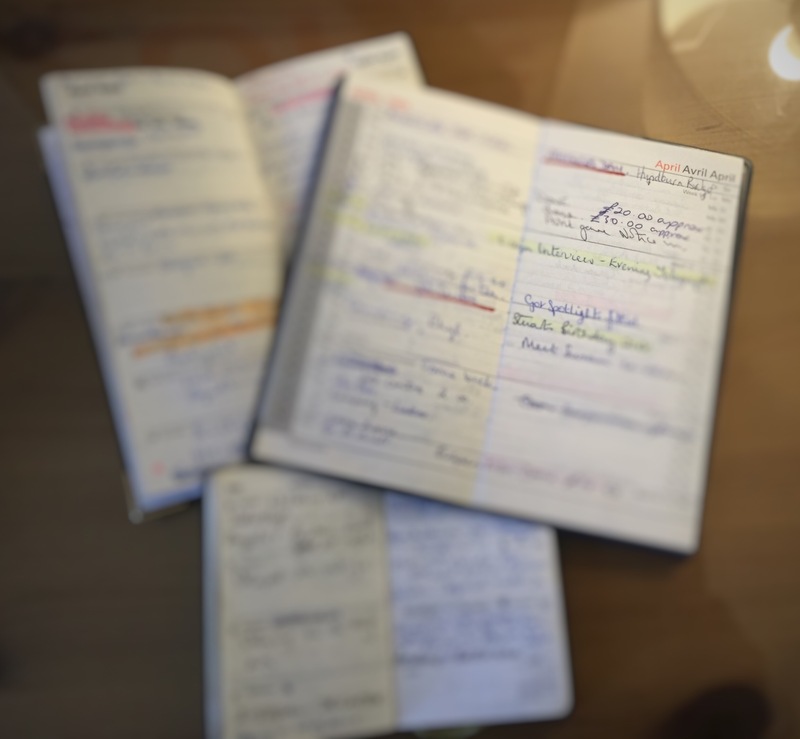 I keep a more dedicated, expansive journal now – and have done for the past two years – a little late to the game, and no idea whether that will induce the same smiles when I’m 92 (should I ever reach that age!!). Think perhaps not – there’s no innocence, no blithe freedom, in my entries as ‘responsible adult’.